I came across Gwen Bell's Best of 2009 Blog Challenge and decided to give it a go. Each day there are prompts to reflect back on some of the best parts of the past year. Thanks to Mandi at No Apathy Allowed for inspiring me to do this. Like Mandi, my favorite part of this challenge is that you are free to only choose the prompts that really inspire you and since only some of them are relevant to sewing or vintage fashion--that's good! December 4th: Favorite book of the year. 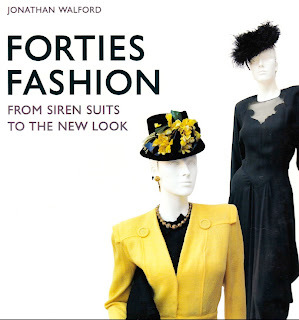 One of my favorite books to come across this year is a book my Dad bought for me from Powell's bookstore in Portland, OR called "Forties Fashion from Siren Suits to the New Look" by Jonathan Walford. It's a great history of forties fashion and includes tons of interesting facts and pictures! It follows fashion through the war period with chapters such as "Kangaroo Pockets and Siren Suits: dress, patriotism, and propoganda in the first year of the war" to another chapter on "Zoots and Zazous: Anti-fashion in the time of crisis" to "Occupation Couturre: Paris ignores the war" to "New Looks: Rebuilding fashion in the post-war world". It's a must read and includes lots of great pictures! 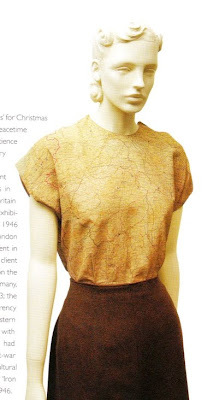 This is a blouse made from a military surplus silk map. "Often called 'escape maps', these were made for airmen in case they were shot down over enemy territory. Silk was warm, durable, resisted creasing, and could be concealed under clothing. Pectin added to the ink kept the dyes from running or washing out when immersed in water, even sea water. After the war the maps were applied to various uses, including blouses and headscarves." December 7th: That gem of a blog you can't believe you didn't know about until this year. There was definitely one blog find that started it all. Sew Retro is a community blog where anyone can post their vintage sewing projects. It is very inspirational and great to see all the talented sewers! It has also lead to me finding some of my other favorite blogs such as: Ancien-Nouveau, Veronica Darling's Crafty Adventures, Wearing History, and Whipstitch Sewing just to name a few. Check out the links to all my favorite blogs on the left. View the original hair tutorial that inspired this look. You are stunning in that hairstyle! Meeee-ow! Cool story about the silk maps -- wow, who knew? And your hair looks awesom! Whoey, you mentioned me, thank you! I was kind of feeling a bit down (must be the darkness, it's the longest night of the year right now) but you made me feel quite a bit happier! Your hair looks really great, I must try that out, I'm the perpetual pony-tail-girl, your hairdo looks SO much better. Yeah..the darkness gets to me too! But I'm glad I made you feel better because I love your blog! You can see the original silk map outfit in the Imperial War Museum in London! I had my face pressed up against the glass when I saw it. WANT. WOW! REALLY? I will have to check that out! thanks for the info! How cool surplus silk map. Stylish and classy.